This beautifully presented one-wick candle from our popular Black Magic range features a sensuous and coveted fragrance, made from a blend of warm vanilla and patchouli combined with relaxing lavender. Slip into the mood with this sensational candle from our evocative range, designed to help you forget the troubles of the day and enjoy intimate time with your partner. Vanilla has been used as a natural aphrodisiac for centuries - its warm, intoxicating aroma calms, captivates and has a euphoric effect on the brain. In the bedroom, it is thought to invigorate, uplifting the spirit, stimulating desire and increasing energy. Patchouli, with its characteristically musky scent, provides warmth to the blend. We use authentic high-quality patchouli essential oil rather than the more common synthetic type, for its stunning aroma and tenacity. Patchouli is highly sensual and can trigger a strong aphrodisiac response. Lavender is a well-known sleep aid but only because of its relaxing properties. It is a fantastic addition to our blend, helping couples to unwind, let go and allow their worries to simply melt away as they enjoy each other’s company. These marvellous essential oils are expertly blended in our natural wax candle. Offering around 50 hours of glorious fragrance, this delightful candle is the perfect way to set the mood, making a wonderful treat for you and your partner or a fantastic gift for a busy couple. 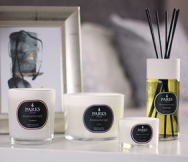 Supplied in a luxury presentation gift box, this exquisitely fragranced candle is likely to become one of your favourites from the Parks range.